Spending a holiday in another country is an opportunity to gain incredible insight into a culture, but it can also leave you feeling a bit homesick. This month, as the Catholic Easter came and went, I couldn’t help but think of home, what I would be eating for Easter dinner, and whether they even sold Peeps in Europe. (A special thank you to Mrs. Courtney, who so thoughtfully continued her tradition of providing me with too many gifts on Easter). Because of numerous delays and schedule errors, I spent the actual Catholic holiday of Easter on an unexpectedly long train trip from rural Romania to Veliko Tarnovo, the old capital city of Bulgaria. When I finally arrived, I was greeted by the old city streets, built into the steep walls of a valley, and magnificent views that suddenly appeared between the old stone houses. The city is stunningly beautiful. Locals joke that when giving directions in Veliko Tarnovo, indications like “left” and “right” are replaced with “up” and “down”. The city is divided and re-divided by a meandering river, and the nearby mountains have miles of great hiking paths. I spent my first days hiking in these mountains, learning about history from some wonderful walking tours, and exploring the abandoned socialist legacy (The notorious Buzludzha monument is located nearby, which was a blizzarding, surreal experience). Veliko Tarnovo is, historically, a religious city, and it is not possible to walk more than five minutes in any direction without running into a church. Many of these churches are hundreds of years old, having survived conquests or having been reconstructed. Most Bulgarians are Orthodox Christians, following a church calendar that differs slightly from the Catholic one. It turns out that Orthodox Easter in Bulgaria is celebrated one week later than the Catholic Easter. This is one of the benefits of traveling, even if you are a bit homesick: sometimes you are able to celebrate a holiday twice. The Patriarchal Cathedral, slowly eroded over the centuries, was rebuilt in its original architecture, but repainted in a modernist style, in the 1980s. I have never seen such modernist religious art in a church. 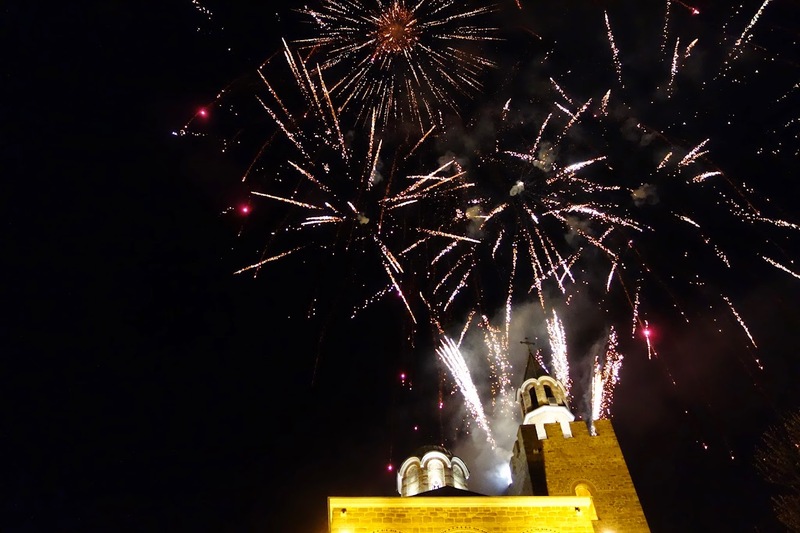 A few Bulgarian couchsurfing friends invite me to share the Easter holiday with them, and so, the Saturday night before the Easter Sunday, we head to the midnight mass and special blessing. We are visiting the Patriarchal Cathedral of the Holy Ascension of God, the most famous church in Veliko Tarnovo, located at the center of the medieval Tsaravets Fortress. This popular church is built at a high point in the city. Holding unlit candles, my friends and I join the streams of people climbing up the hill. Deep church music floats down from above, helping me feel warm in the cold night air. We arrive at the crest of the hill, standing just below the church, to listen to the service. I don’t understand the Bulgarian, but the music evokes emotion anyway, and the energy in the air is palpable. I watch the crowd, in a trance, and the priests. My friend Plamena points out the head priest, the mayor, and all the other notables attending the service. Looking down the winding path, I can see hundreds of people lined up to listen. A bit after midnight, the church bells begin to ring across the city. With a chorus of “Christ is Risen”, everyone readies the small candles that they have brought. The priest enters the crowd with his candle, and the crowd surges toward him. The flame is passed from person to person, until everyone is holding their own candle. I light a candle of my own, protecting its flame as we start to make our way back home. Most Bulgarians will keep the candle lit to take home to their family altar. Though I have no altar back at my hostel, I protect my candle as I walk down the hillside. Looking over my shoulder, I realize how beautiful our procession is. A line of pilgrims stretches back behind me, slowly winding down the mountain, each person’s face lit by a candle’s flame. The view back, looking toward the cathedral, with everyone holding their lit candle after the service. Me, holding my lit candle after the service. The next morning, I wake up early, despite having stayed up for the midnight service. It’s a holiday. There is food to be eaten! Bulgarians have many, many traditions around food on Easter, but there are two absolutely necessary components: dyed eggs, and kozunak, a braided bread. Though I was staying in a hostel as a tourist, the kind Bulgarians would never keep the foreigners out of the biggest celebration of the year. The hostel staff dyed eggs for breakfast, and another Bulgarian guest shared her homemade kozunak with me. Together, the combination made a wonderful breakfast. At a Bulgarian family table, before you crack open the shell of your hard boiled egg, you “fight” with your neighbor, seeing whose egg will crack the other’s. This continues on until there is a clear winner, the one with the strongest egg. I was told that the winning egg is kept until the next Easter, for good luck. Though my egg broke during the first round, I didn’t mind. It meant that I got to eat it. Dyed Easter Eggs at the hostel. Delicious breakfast! With my days in Bulgaria ticking down, I realized that it was best to leave Veliko Tarnovo on Easter. I took a short afternoon bus to Plovdiv, another major city in Bulgaria. When I arrived in Plovdiv, just as in Veliko Tarnovo, the streets were full with celebrating families and happy couples. The sun was shining, making a beautiful spring day, and everyone was outside. After walking around the downtown, I spent the evening in a new hostel, chatting with the staff and their friends. As the evening went on, more and more people joined us, and practically no one arrived empty handed. Every Bulgarian brought a sweet, some kozunak or biscuits or cookies, until the table had a pile larger than we could eat. I smiled to myself, because I am reminded how all over the world, we all seem to celebrate holidays the same way: with an excess of food, and good people to laugh with. And how lucky I am to find these things where I go! After the midnight service at the cathedral finished, there was a beautiful fireworks show. The lights lit up the castle and everyone cheered as we held our candles. These are holidays to remember!